One Belt, One Road (OBOR) is China’s ambitious initiative unveiled in 2013. In fact, it’s two plans combined to form a larger framework of new trade routes. The first of these is One Belt (the orange line in the above map). 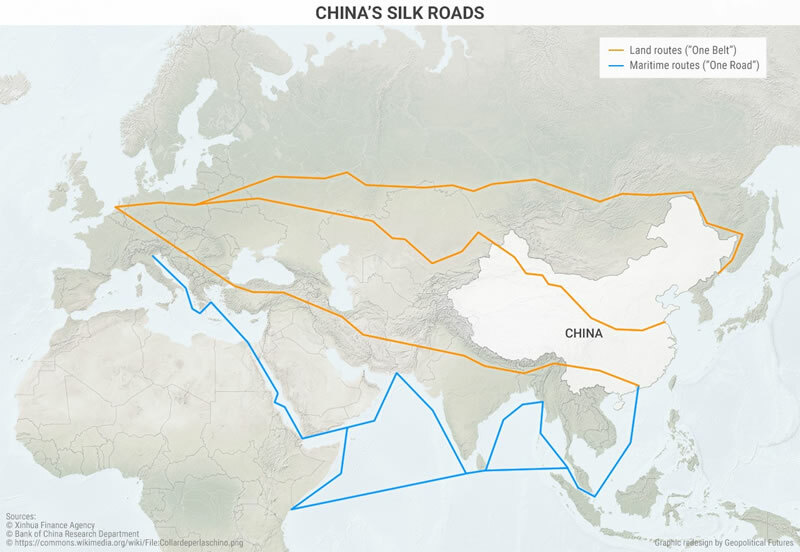 It refers to the development of new infrastructure—particularly railroads and highways—to connect China’s interior provinces with Europe by way of Russia, Central Asia, and the Middle East. It’s a tall order, and expectations are low that China would be able to build them. The bigger problem with One Belt is geopolitical. Eurasia is in a state of crisis. Central Asia in particular is one of the world’s most politically unstable places. The region is a patchwork of states whose borders were drawn to make the countries more easily controlled from Moscow during the Soviet era. It is hardly a promising market for Chinese goods. The other trade route is One Road. It’s essentially a new Maritime Silk Road. This part of the plan is meant to create more Chinese ports in countries along maritime routes. Which makes sense: About 80% of global trade by volume and over 70% of global trade by value is conducted by sea, according to the United Nations Conference on Trade and Development. So far, One Road has been a mixed bag for China. It has secured contracts to build ports in Myanmar and Sri Lanka, but a deal with Bangladesh fell through in 2016 when Dhaka opted for an offer from Japan instead. From a US perspective, China’s projects along the Maritime Silk Road are overblown. Constructing ports will not provide China with permanent bases for Chinese destroyers or armies—the countries in question have yet to agree to host them. More important, the Chinese navy is still not capable of extended, long-term deployments in countries far from the mainland. In short, OBOR matters relatively little. The initiative itself is ill-defined and has done very little for China since it was announced. Even if it’s successful, OBOR won't swing the global balance of power. But if OBOR is to be truly transformative, it will have to do what it was meant to do: right the wrong of the Chinese economy. Whether it can remains an open question.